It is very usual to come across texts on the Internet written in languages we don't know. That is why having a dictionary integrated into the browser itself can help us to speed up our activity on the Internet, both at work or for fun. With Dictionary Switcher you can use whichever one you need at each moment. Dictionary Switcher is a Firefox add-on, the purpose of which is to be able to use any of the dictionaries installed on your browser as quick as possible. To do so, the browser will swap them automatically, detecting the language of the web you are visiting, or you can do so manually, showing on the status bar the dictionary used at each moment. 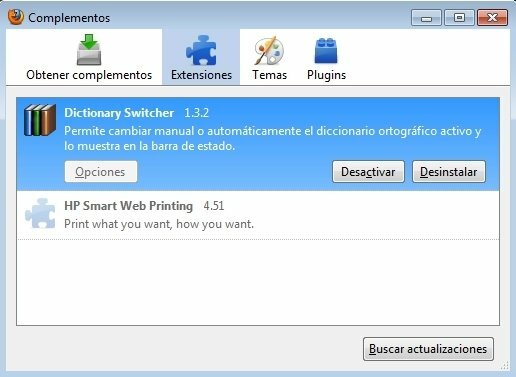 Automatic or manual switch of the dictionary tool. Automatic detection of the page's language. Automatic detection of the language when typed in. Possibility to memorise the language of the website. Download Dictionary Switcher for Firefox and always have at hand the appropriate dictionary for your web browsing. The dictionaries aren't installed with the add-on. May not work with certain versions of Firefox.